It’s time I told you about our Mullion oilskins. A couple of years ago we were singing the praises of Decathlon’s cheap and cheerful breathable oilskin jackets; and we still reckon that those oilies are far better value for money than the leading name brands. But we’ve now come across something which knocks them into a corner. 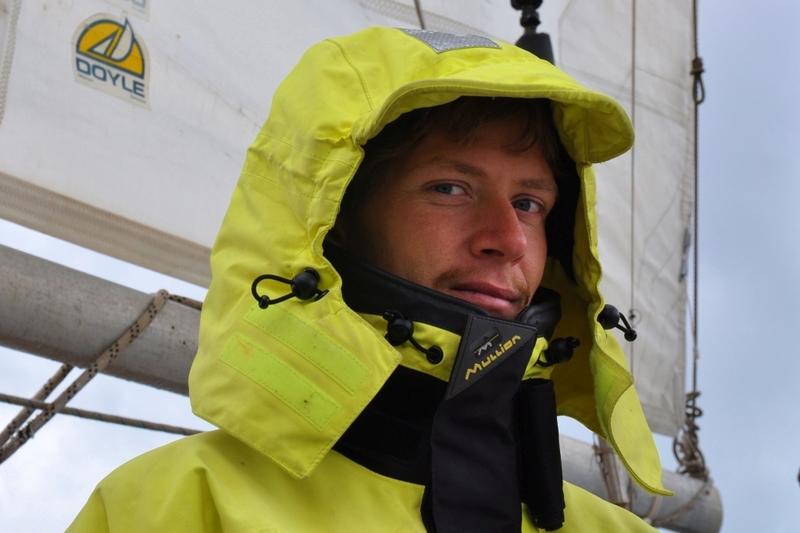 According to our Irish friend, Mullion’s one-piece Aquafloat oilskin is so snug and cosy that he goes to sea wearing nothing else. Literally. Well, nothing other than his knickers. 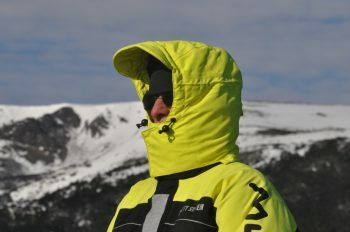 This sounded too good to be true – particularly since the said garment costs no more than the Decathlon jacket and less than a quarter of the price of a Musto Ocean jacket – but the only way to find out for sure was to buy one and try it. 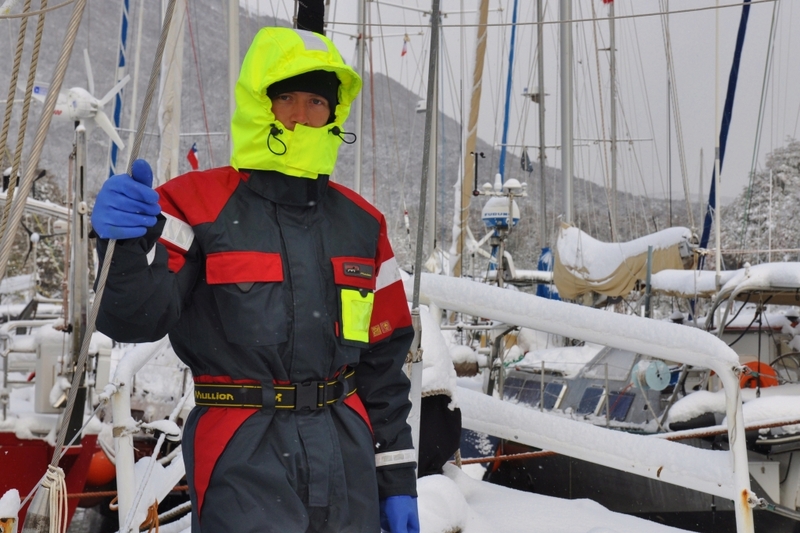 Unfortunately, the purchasing of our Mullion Aquafloat thermal flotation suit was left to the skipper – so we ended up with a size Large garment. Since Nick doesn’t feel the cold, and since he is, in any case, not much bigger than me… well, suffice it to say that this article of clothing has not seen as much wear as it might have done. But it’s seen enough for me to be able to say that the Irish man spoke no word of a lie. 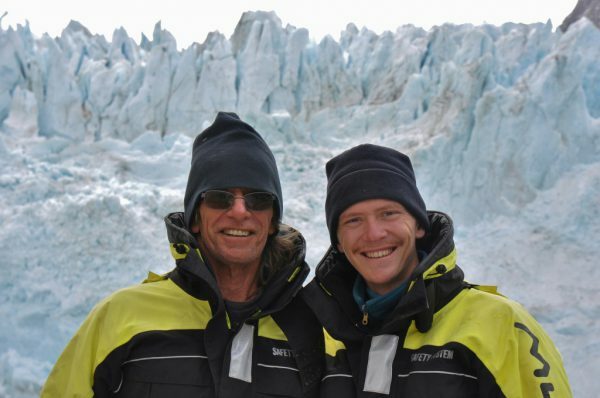 I wore that suit all down the coast of Argentina, in the wind and the snow and the icy spray, and whereas I would normally be freezing to death, I was as warm as toast. Indeed, the only problem I had with the Aquafloat suit was that I got too hot. Every time I had to leave the wheel and alter the set of the sails, I worked up a sweat; and so the inside of the suit became damp. To be honest I think that part of the problem lay in the fact that I didn’t quite trust the thermal lining to do its job, so I was still wearing thermal undies and a woolly jumper. Oh, and did I mention the fleece snood (or thneed, as I prefer to call it) which I made for myself before we set out? 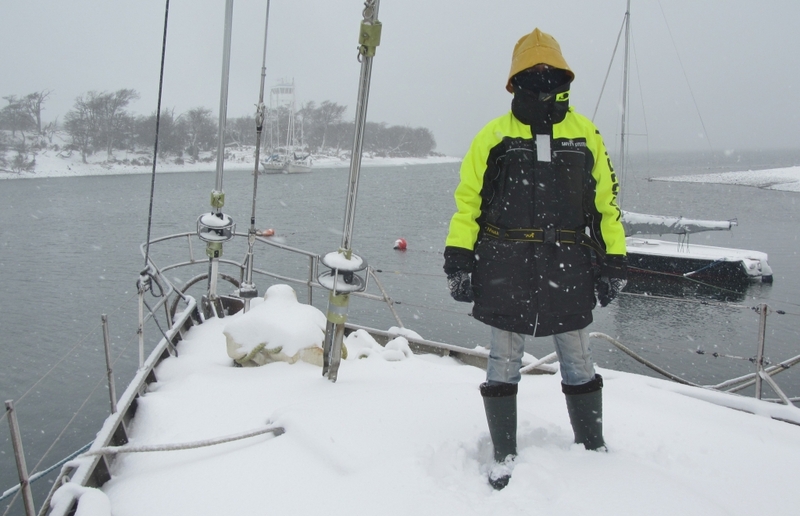 What with that, and my woolly hat, and a pair of fleece gloves worn inside fishermen’s gauntlets… Well – with cuffs and the collar all sealed, and the belt on the suit fastened tight, there wasn’t really anywhere that the steam could have escaped. Suffice it to say that I liked the Aquafloat onesie well enough to decide that I would like to try a jacket. One of the appropriate size… But while perusing Mullion’s website we found that they also sell a ‘breathable’ suit, and ‘breathable’ jackets and trousers. Now… we’re a bit wary of ‘breathables’. 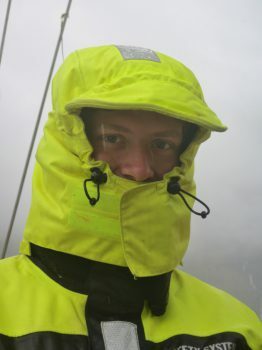 When I wrote my article about those Decathlon oilskins we had owned and used them for two years, and, as I explained, they were no longer waveproof. This probably sounds pretty unimpressive until you consider that, in our experience, the top-price jackets are no better. In theory, when these high-tech garments become porous you can re-proof them, but we have found that the results are not very satisfactory. Nikwax is very effective in making the outer shell waterproof again, but in our experience, the ‘breathable’ teflon membrane is so thin and vulnerable that the process of washing and re-proofing an old jacket causes it to fall to pieces. So, as I say, we were in two minds about whether we wanted a ‘breathable’ jacket – until the MD of Mullion took it into her head to give us four X5000 jackets and four matching pairs of X5000 trousers – gratis! – for us to gear test. 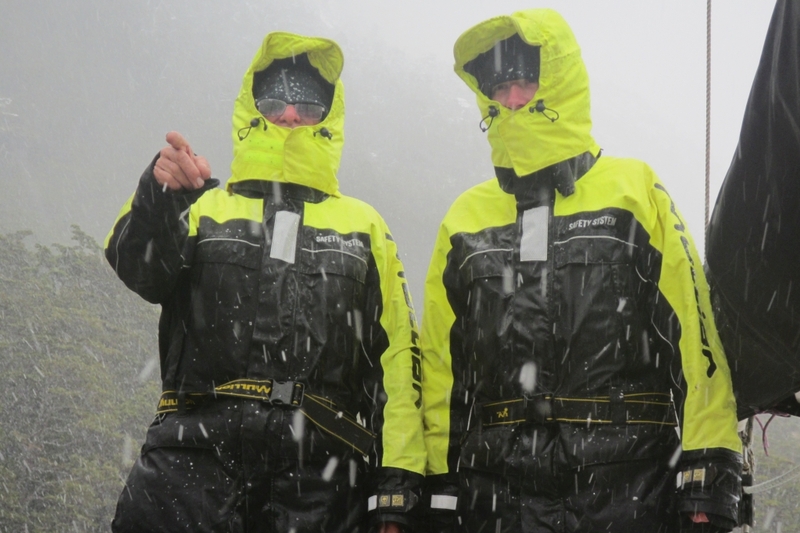 Besides testing these jackets in the most rigorous environment available, at the southern end of South America, we will also be supplying feedback in the hopes of creating the perfect affordably-priced oilskins. So – after that lengthy introduction to the subject, let’s get down to the nitty-gritty. 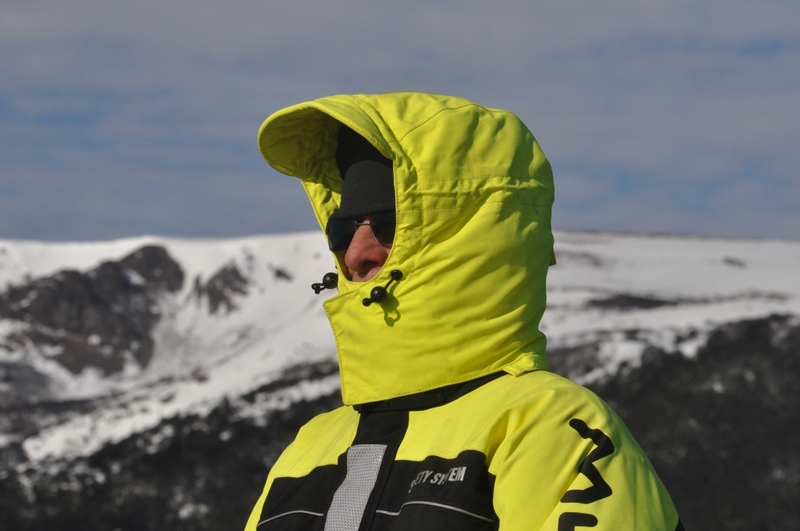 The X5000 jacket is specifically intended for cold weather use. In fact, I’m told that it was designed for a team of skidoo drivers who were crossing frozen lakes. Like all of Mullion’s garments, it contains a layer of foam which not only serves to keep the wearer warm but also provides buoyancy (50N). Clearly, this wrapping of closed-cell foam is not going to help with ‘breathability’, but by way of a compromise the foam is perforated. I guess the ‘breathable’ cloth is on the inside of the foam, and whereas in most oilskins this fragile layer is protected only by a net cloth, in the case of the X5000 there’s a layer of ‘wicking’ fleece-like material. This also makes the jacket much cosier than most. The ‘breathability’ of the garment is further improved by underarm zips. We’ve never known them to leak, and they certainly do let out the steam. All you have to do is remember to undo the zip before winching in the genoa! 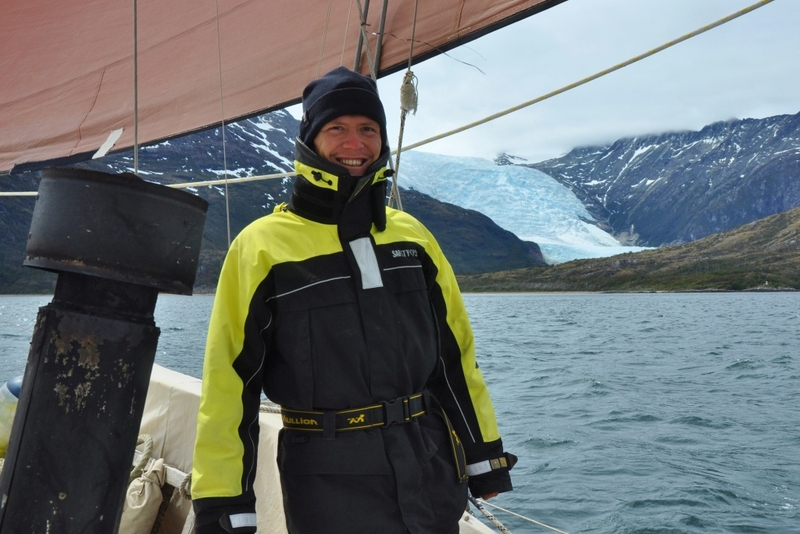 The combined weight of the durable outer fabric and the foam also makes the X5000 heavier than most similar jackets – and this is the thing which Roxanne likes least; she reckons that the coat makes her feel like a well-shelled tortoise. The rest of us consider the added weight to be just the price one has to pay for extra warmth and durability – but there are certain other things about this garment which we consider to be less than perfect. The worst thing is the zip, which has ‘made in China’ written all over it. I frequently have to ask someone else to come to my assistance in starting the thing. Hopefully, Mullion will see fit to rectify this fault in future editions of the X5000. The Aquafloat one-piece doesn’t have this problem, as the zipper is never required to separate from the opposite side of the closure. The second problem concerns the cuffs and the collar. The design of the cuffs is very good: On the outside, the sleeves can be drawn tight around the wrist in the usual way, with velcro tapes. For added protection there are inner cuffs made from smooth neoprene, and these inner cuffs are also adjustable The problem is in the sizing. Although we four are all of slender build, we find that the inner cuffs can scarcely be fastened even over our bare flesh. And when the temperature is barely above zero, you don’t want to expose any bare flesh. Again, this is something which Mullion could easily remedy with future editions of the jacket. 50% of us don’t like the fact that hood on the X5000 just hangs down the back – where it flaps around or fills with snow – instead of tucking away in the collar. However, the other 50% don’t get on with hoods tucked into collars anyway, and always leave them hanging out. 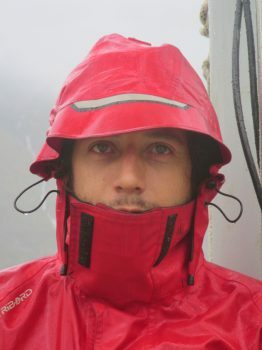 The Aquafloat hood does tuck into the collar. The X5000 hood can be unzipped and stowed in the inner pocket – but one can imagine how frustrating it would be to spot the approach of a squall and to be running around, reefing and generally making all ready, without being able simultaneously to flip up the hood and so prepare one’s own state of dress. The hood cannot be reattached without first taking off the coat. These quibbles apart, the hood is one of the finest features of the Mullion oilskin range. In foul weather you can just hide yourself away inside it. Mullion garments are the first that we have ever worn whose hood is comfortable still even after hours of sitting at the wheel. That’s because they’re the first jackets we’ve used where the hood doesn’t pull hard against the crown of the head, forcing the wearer to take the weight of the jacket on his head and neck. This is a very important feature. The hood is easily big enough to allow the use of a woolly hat; in fact, I’ve been known to wear two inside mine, and still without the hood resting on the top of the head and the neck being strained. The hood is also deep, so that one doesn’t get side-swiped by the spray. It features a very big peak. In fact, in our view the peak is actually too big, in terms of its depth (fore and aft) as it gives the hood a lot of windage. However, since it’s fitted with a wire luff (or whatever you call the leading edge on a hood) it can be formed to any shape you like. If you want to shield your face you can bend the wire so that the peak is folded downward; and if you want to improve visibility you can even fold it right back. The peak on the Aquafloat is even better than the one of the X5000, because it’s 2” wider (which is to say, it comes down the sides of the hood, giving better protection). But we’ve thought of ways to make it even better! (This is how we pass the time when standing at the wheel on a vile day.) 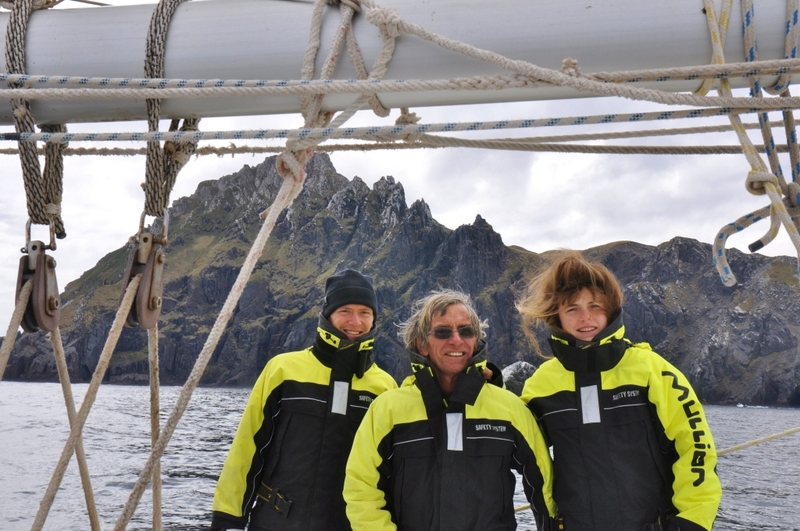 We would like the hood to have an additional inner edge fitted with a drawstring. The sunshine-yellow jacket in this next photo contains this feature. It keeps out the draughts and any sneaky gobs of spray. This yellow oilskin jacket is supposed to be XL, but it’s really too short even for Nick (who wears a medium sized Mullion). Its best feature, apart from the drawstring inner rim to the hood, is a nice tall face-flap. That’s another thing that we’d very much like to see on our Dream Oilskin. The following two photos show Caesar and Gean wearing the Mullion X5000 and a red Decathlon oily. 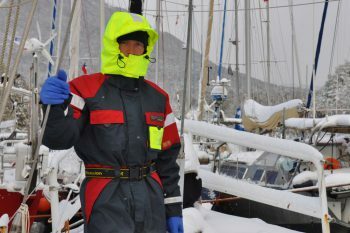 Caesar has had the opportunity to wear the latest Musto Ocean jacket while working on a rich man’s yacht, and dressed in ‘team colours’, and he assures me that the Musto hood is even better than the Mullion – largely because it has a taller face-guard – but, as he says, it is certainly not worth the extra £400. The Aquafloat features hand-warmer pockets at hip level, and the X5000 has them at chest level. Since this family is equally divided as to which are most comfortable… well, you pays yer money and you takes yer choice. The pockets on the X5000 are so big that I have been known to lose my waterproof camera in there. I love them; but if you fill them full, walking becomes awkward. 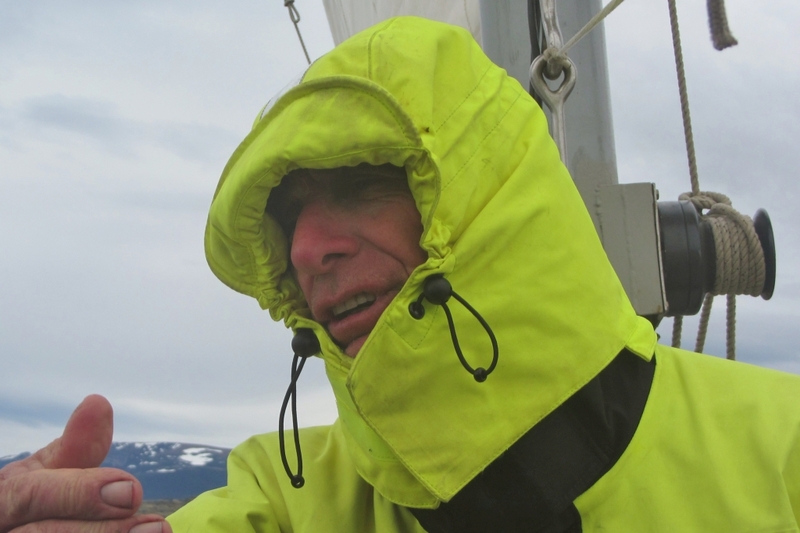 That reminds me: An oilskin jacket is actually a multi-purpose thing, particularly when one is living aboard. There isn’t the room to carry more than one warm and waterproof jacket for each crew member. So, besides sailing round the Horn our Mullions have also climbed various peaks and scrambled through thorny bushes; and they have endured this maltreatment very well. This is the author, rarely captured on film but seen here modelling the ideal kit for winter walkies with the dog (out of shot; probably already half way up the hill). To wit, we have the Mullion X5000; my super-cheap, super-warm thermal wellies; the aforementioned thneed; a pair of lined woolen gloves; and – over my woolly hat – a sou’wester. 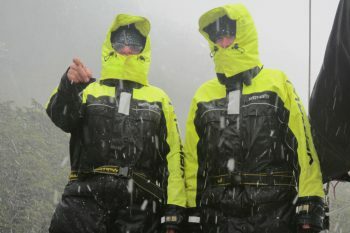 A sou’wester allows better all round visibility than a hood. Mind you, sou’westers aren’t what they used to be. Despite the fact that it’s made by Guy Cotten, who grew up serving the needs of French fishermen, this one is a poor imitation of the real thing. The sou’wester which I recall from my childhood had a front edge which was broad enough to fold back and funnel away the rain, whilst the back of the brim was even wider and easily covered the collar. It is an accessory which is sadly missed… But I digress. So, who are Mullion, and why aren’t their oilskin jackets hanging in the chandleries? 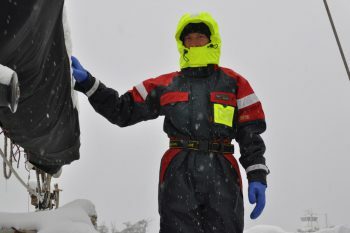 Mullion are a British company who make flotation suits and lifejackets for the marine industry – which is to say that their present range of garments is intended for professional seafarers working on pilot boats, oil-rigs, and big ships. Their motto and mission statement (quoted above) was first used by an RAF Search-and-Rescue unit brought into being during the war. Now, your modern-day professional mariner doesn’t tend to stand on deck with waves breaking over his head – whereas yotties do. 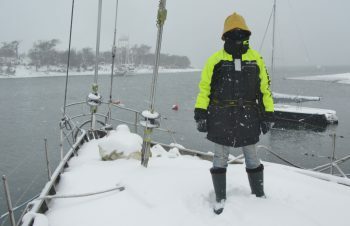 So, whereas the public’s perception is of a leisured clientèle needing less in the way of protection, the reality is that yachtsmen are the only real sailors left in the world, and we need better clothing than the pros. 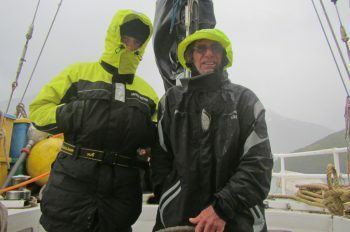 We need jackets and hoods which will be comfortable and waterproof for a four hour stint in the front-line against the ocean’s might. 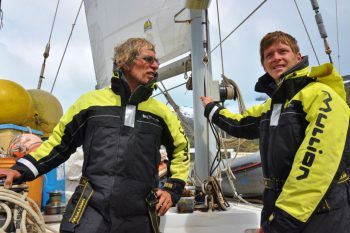 Happily, it would seem that the advances in comfort made by Musto et alia are trickling through to the working man’s clobber – he no longer goes to sea in a plastic jacket – and since Mullion are not yet accustomed to making stuff for yotties, their merchandise is priced accordingly. 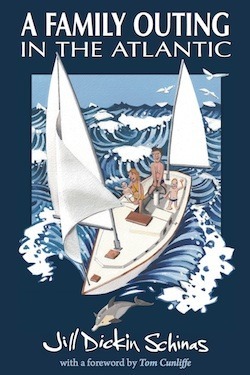 As we all know, anything with yachting written on it is bound to be over-priced. To cite an extreme example: Musto’s top of the range, Ocean wellies cost £275. No, there isn’t supposed to be a decimal point after the seven. Their chest-high trousers cost a further £500. Henri Lloyd’s Ocean jacket is also £600 from the online cut-price chandleries. Gill’s top of the range jacket is about £500 from the same suppliers. Meanwhile, the Mullion X5000 jacket costs just £232 from this fishing shop, and I suspect that it would cost a great deal less from a marine safety outlet. Mullion’s Aquafloat Superior jacket costs just £118 from an outlet which evidently serves the needs of professional seafarers. This is less than the price for Gill’s coastal jacket – a jacket which is really not much more than a waterproof anorak. The Mullion X5000 (on the left) costs almost exactly the same as Gill’s coastal jacket (right), and it’s easy to see which is the better buy. Henri-Lloyd’s ‘onesie’ costs £900 from the on-line sailing clothing stores. Mullion’s breathable X5000 suit, with its built in flotation, costs £195 from these people. The Aquafloat Superior one-piece suit costs around £147 from the same outlet. Trust me – you do not! In fact, if you’re planning a standard crossing from the Canaries to the Caribbean you won’t need any oilskins. What you’ll need is sun-block. It is true that getting down to that latitude is another story, as is the return trip. 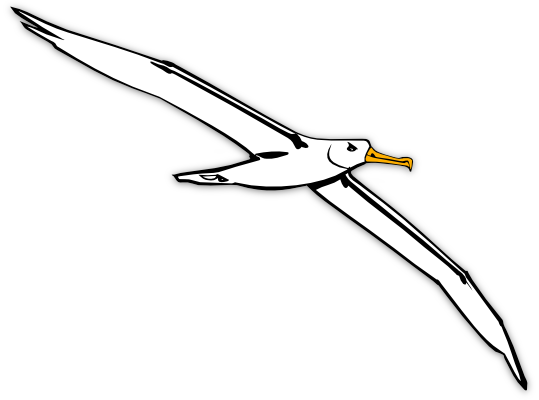 A passage through Biscay or through the Gulf Stream, and a west-east crossing of the Atlantic – these are undertakings which will almost certainly involve some wet and very windy weather. But, even so, I can assure you that, unless you are making the trip in the middle of winter, you will not wish you were wearing the sort of kit that the Volvo Ocean popstars wear. A basic oilskin jacket and some honest-to-goodness fishermen’s waterproof trousies will do just fine. We haven’t yet had much opportunity to use the Mullion X5000 trousers. On the whole we prefer to wear tough PVC trousers over thermal undies; but perhaps the thermal flotation trousers will come into their own when we visit Antarctica. In the meantime, we’re very happy with the jackets and we will continue to depend on them during our winter passage through the icy Chilean channels. Great review, thank you! Do they make the Mullion in men’s sizes only? I cannot see the womens styles or sizes, and there is no way I could wear a men’s size. Thanks! I doubt whether Mullion are making jackets especially for women (yet…), because there are not a lot of women who work as fishermen, tug boat drivers, and so forth. Our X500s are size Medium. They’re long – which is a thing that we like a lot – but in all other respects they’re a tad on the small size. We’ll… they are when you try to wear them over two jumpers, anyway! You might find that a Small size would fit you. I think there’s actually a sizing chart somewhere on Mullion’s website – I seem to remember using it – but if it is there, it’s well hidden. 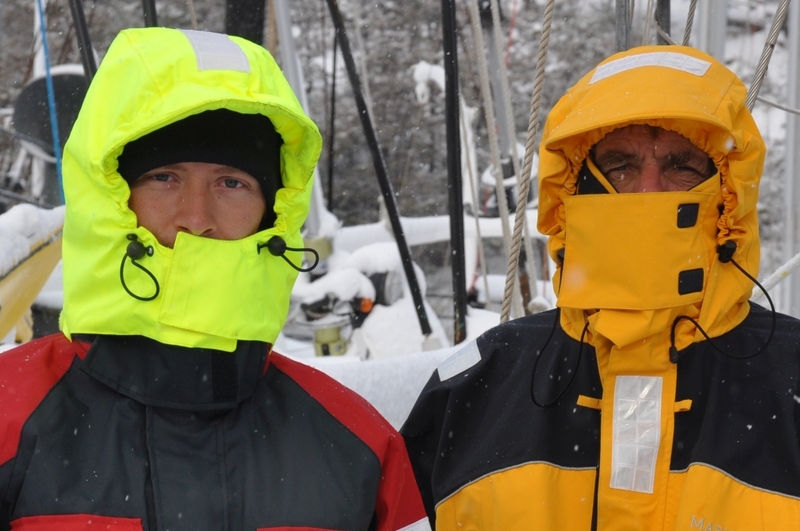 Something not mentioned in the article is that the coats are quite a bit longer than most oilskins. For me (though I am relatively short) this is one of their best features – it keeps you warmer and dryer, especially when sitting down at the wheel. I agree that the zip is the main thing that lets down what is otherwise a really excellent oilskin jacket. I don’t have any trouble doing it up, but I do find that it tends to unzip itself from the bottom up if you forget to do up the built-in belt. My only other complaint is that the face flap is too short (in both dimensions) – but it’s certainly better than most oilskins I’ve tried. The hood as a whole is really good, but if it came down over your forehead more that would make it perfect! I love the high collar. My apologies for not having got back to you sooner. 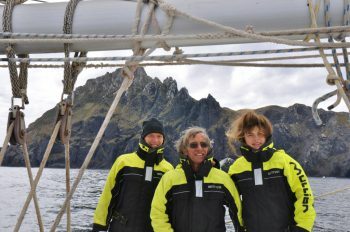 We’ve been slowly making our way up through the Chilean channels and haven’t had internet access. To tell you the truth, I can’t remember the name of the company that I bought my wellies from. I got them on Amazon. They’re olive green with thermal inserts that can be easily taken out to air the wellies. The only thing written on them is Made in Poland. Nick has the same wellies as me. He found them in a dustbin! I have to make new liners for them. Roxanne has Guy Cotten thermal wellies. Blue. Also good, but a lot heavier. I think they were £35. Caesar has Muckmasters. They got a stress hole within weeks, but because they are double shell they still don’t leak. £85. Very heavy. I couldn’t use that design.